The HydroAir Genesis range of blowers are easily identified by their distinctive blue casing. They are used by many hot tub manufactures but will more commonly be found as the blower of choice in many whirlpool baths out there. The Genesis range all feature rotatable outlets making installation easy and a threaded 1.50"BSP x 32mm union is included. A host of options and features are available throughout the range. See the specifications below. The G70-2ANT-S-EG comes fitted with a 3 speed pneumatic switch, which allows the blower to be cycled through the 3 settings by the push of an air button. A carefully positioned non-heated blower will draw warm air from pumps and heating equipment. 500W version - Used mainly in whirlpool baths and small hot tubs. 700W version - Used mainly in whirlpool baths and small to medium sized hot tubs. 900W version - Used mainly in hot tubs, some large whirlpool baths. 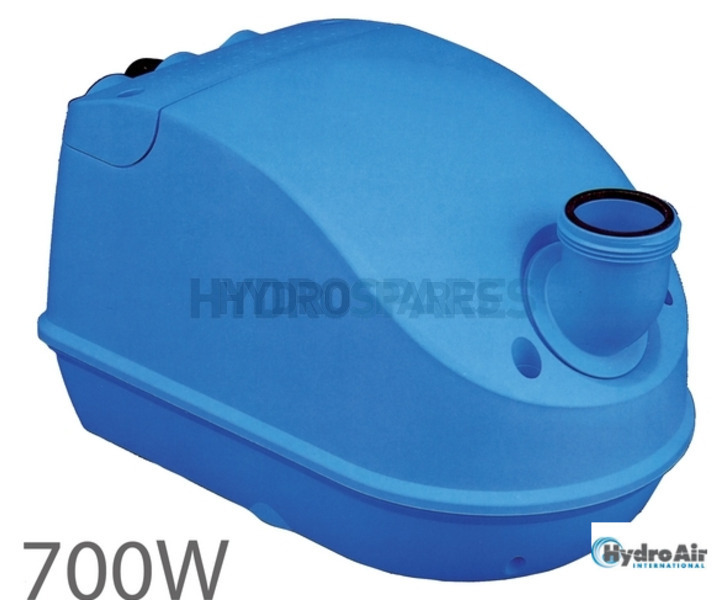 1200W version - Used mainly in swimming pools but can also be found in large hot tubs or spas.